Unlocking Windows password is a necessary step when you forgot the login password of Windows 7 computer. Without the right password, you can't get into the system and lost access to all files stored in that device. The first method we could think of is reinstalling the system with Windows installation disk. However, this is not a good option when they were important data on that computer because a reinstall will delete wipe the whole system drive. No one wants to lose their valuable data. And not to mention the time it will take to install the drivers and programs. If you were the one who need to unlock the login password, then you should read this tutorial carefully. We will list two secure ways to reset the password without any data loss. In fact, we can do this in a fast and easy way without any special computer techniques. 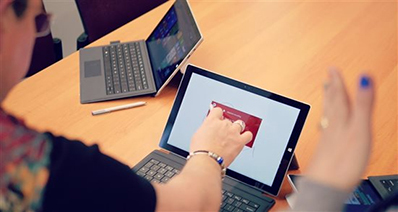 One is by creating Windows password reset disk with Microsoft service. And the other is by using UUkeys Windows Password Recovery. To begin with, it is important to know that Windows 7 allows you to create a disk for password recovery. It can be a USB stick or floppy disk. This recovery disk will work only on the computer where it was created and it becomes like a security key to be used in emergencies when you forgot login password. 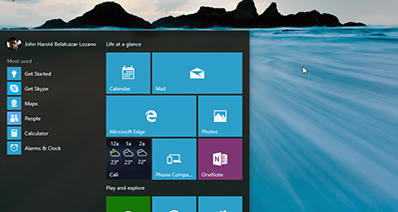 Step 1: From the Start menu on Windows 7 and click Control Panel. Step 2: Click on User Accounts and Family Safety option. 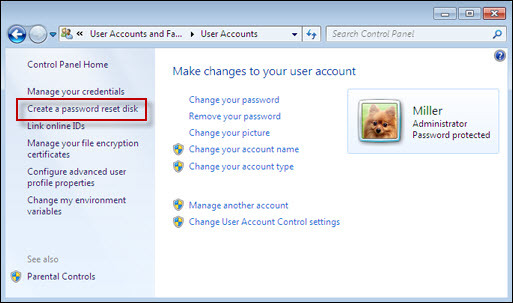 Click User Account and launch the utility called "Create a password reset disk". Step 3: Once opened, you can follow the wizard by following the instructions and click Next. 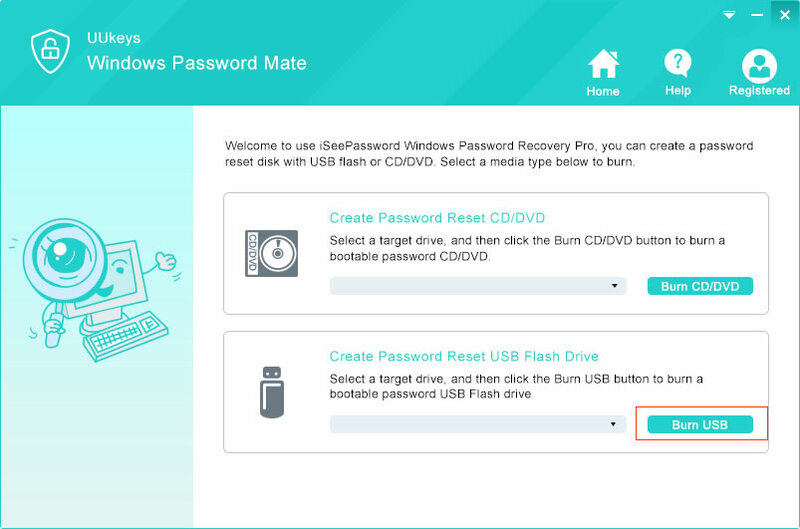 Step 4: The only thing to do is to select the USB stick from drop down box and enter the current password for the user to create Windows password reset disk. Step 5: You can now eject the USB driver and use this disk to reset password when you forgot it. Please note that, the above method only works in the situation that you created a password reset disk before you forgot the password. If you didn't make a password reset disk in advance, then you need to use password recovery programs to unlock the password. We will give more details in the second method. UUkeys Windows Password Recovery is a powerful and easy-to-use program to remove Windows login password. It uses a macro program to boot into the locked computer and reset account password later. There is a graphics user interface in the whole process so anyone can know how to do this without knowing much computer staff. With this tool, you can recover password from all Windows versions, including Windows 7, Windows 8 and the latest Windows 10. Windows Password Recovery comes with 4 different editions: Personal, Professional, Advanced, and Raid. Just select the right edition to unlock your password in few minutes. Then you can regain access to your computer. Another Windows computer you can use temporarily. A New CD/DVD or a USB flash drive. UUkeys Windows Passsword Recovery installation file. You can't do anything with the locked computer. 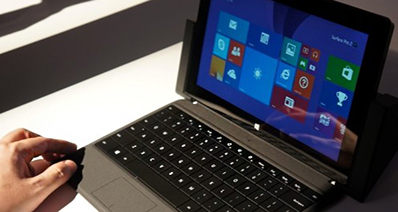 So you need to find another Windows desktop or laptop to unlock the password. Please click the following download button to save the installation file on another accessible Windows computer and install it later. Run the program as administrator and insert a CD/DVD or USB flash drive into the computer to create a password reset disk. My suggestion is to go with USB drive because it is easily to get one now. In addition, many computers are not shipped with DVD drive now. So even you create a password disk with DVD, you can't it later. Now select the drive name from the drop download list. 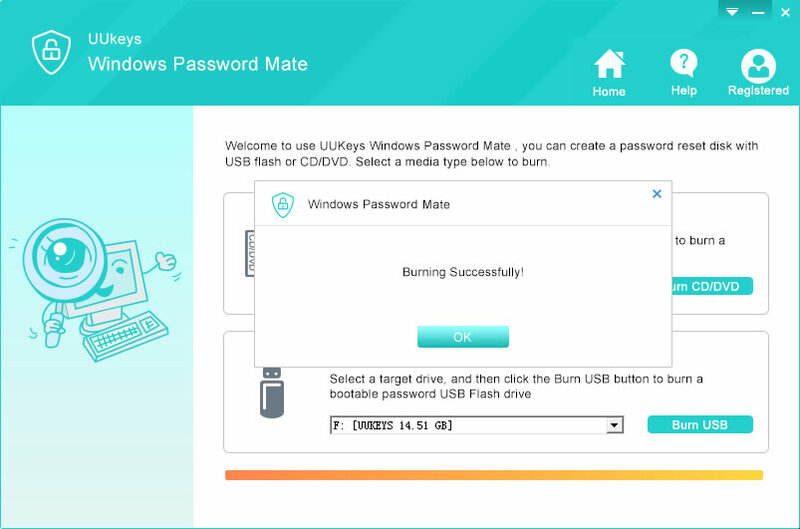 Then click on "Burn USB " button to simply create a password recovery disk. Remove the USB drive once the burning is done. To make the password reset disk work, you should first set the first boot device to USB drive. You can do this in BIOS settings. This varies a bit for different computer brands. Usually, press F12/F10/F2/ESC key on computer startup to get into BIOS settings and change boot order under Boot tab. Now, simply insert the password reset disk disk to your locked computer after changing the boot order. Then you will be prompted to a graphics user interface where you can reset the password within a few clicks. After booting from flash drive, Windows Password Recovery will start up with a user-friendly window. 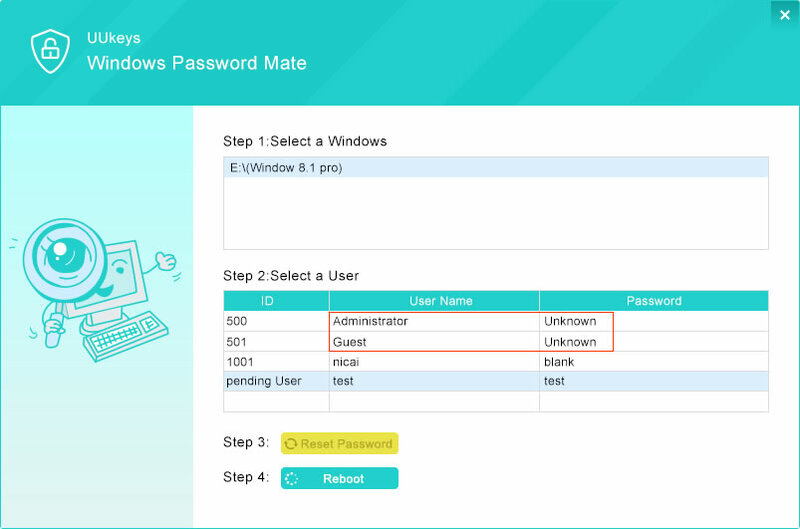 Now simply select the target user, which you want to reset your password from the user list and click "Reset Password" to set the user password. The password will be removed and shown blank. Now just eject the password recovery disk, and restart your computer then you can feel free to login without a password. If you signed in with Microsoft account, then you can reset the account password with online service and use the new password to login the Windows computer. This is by far the easiest way to unlock Windows 7 login password. The above suggestions work in different situation so please choose the right one according to your own needs. For me, UUkeys Windows Password is the best program to reset Windows password. Once you created a password reset disk with UUkeys, you can use it at anywhere and any time later.